YS-Opoly – Get Your Game On! 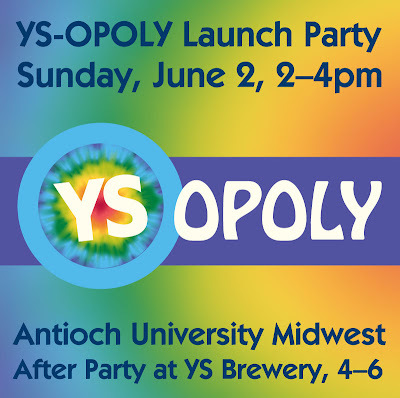 You are invited to PLAY at the YS-Opoly Pre-Launch Party for the new customized game about the Village of Yellow Springs on Sunday, June 2 from 2-4pm at Antioch University Midwest. Show your YS-Opoly Spirit by representing your favorite aspect of the game – “Be The Board”! The YS Brewery will be hosting an After Party from 4-6pm, with music from local buskers and Ringo’s North Star Mobile Eatery serving up stone hearth pizza, gourmet burgers & quesadillas. Bring your lawn chairs and hang out on the MillWorks patio. Let the games & festivities continue all afternoon! From 2-4pm, enjoy food & festivity with an array of VIP guests including Young’s Jersey Cow Barnabe, the YS Schools Bulldog and several of our favorite local musicians including Will C, Ryan Stinson and Warren Kearney (a.k.a. That Uke Guy). Games will be set up in the YSI Multipurpose Room if you cannot wait until you get home to play, and make sure to get your pictures with the Corner Cone Golf Cart and RE/MAX Balloon. Notably, the “Project Peace: Confronting Bullying through Art” student-produced artwork will be on display, and tour the YS Arts Council’s Permanent Collection housed at AUM. A special treat will be a mini-performance from the Yellow Springs Kids Playhouse! Don’t miss this opportunity to have fun with the YS community! We invite everyone to “BE the Board” with awards for the best costumes, and enter our “Free Parking” lucky draw for a chance to win such fabulous prizes as an autographed print of Kathy Moulton’s YS-Opoly board artwork, a Main Squeeze Brewing Kit, Art by Sandi Sharp, YSAC’s “Keep Yellow Springs Weird” t-shirts & Permanent Collection Notecards, Johanna Mosaics Garden Cookies, Sessions with Yogini Marie Hertzler, a YS Brewery Goodie Bag, and an autographed NFL football from RE/MAX Victory, The Chris K Group. One winner will choose a Yellow Springs nonprofit to receive the Free Parking lucky draw donations. Several local organizations such as the YS Bicycle Enhancement Committee, YS Senior Center, Yoga Springs Studio, Village Cyclery and Reiki Gong Dynamic Health will be highlighting their work, and there will be loads of Free Art from around the world to enjoy! Meet Behrle Hubbuch and other artists who have made YS-Opoly a true work of art. Don’t forget to wear your official YS-Opoly Button! The YS Brewery will be giving discounts on its local craft brews to button wearers – pick one up at the Visitors Center in the Yellow Springs Station. And, make sure to Grab a “Piece” of Yellow Springs with your YS-Opoly “Get Your Game On!” t-shirts screen printed using eco-friendly practices by Basho Apparel, A JCox Company. At the Party, Bing Design will unveil the YS-Opoly Box Top, highlighting the intense creative effort involved in making the game. With a charitable giving goal of $5000, YS-Opoly has already generated proceeds to benefit more than 15 local nonprofit organizations, including the YS Arts Council, YS Kids Playhouse, YS Schools, YS Senior Center, Tecumseh Land Trust, YS Skatepark, YS Bicycle Enhancement Committee, Community Children’s Center, YS Center Stage, Friends Care Community, John Bryan Community Pottery, Children’s Montessori Cooperative, YS Heritage, Little Art Theatre and Yellow Springs Home, Inc. There are a limited number of first edition YS-Opoly games available (retail price $25), so make sure to reserve your copy by contacting Brian Housh at ysopoly@gmail.com or 937-319-1116. You can order games online at www.YellowSpringsOpoly.com or send your payment to “YS-Opoly” at PO Box 735, Yellow Springs, OH 45387. Follow us on Facebook!